Is the trim and door paint eggshell like the walls or semi gloss, as traditionally used for these items? Hi Cindi. The inside of the rooms also had the American Clay application on the walls, so we continued the same door and trim color inside as well. Thank you! My conclusion is that the door color must work for each room it leads into. I love the louvered doors... where can I find something similar? These doors were custom ordered. You can do an internet search for custom door fabricators and you will find many sizes and options available when ordering. While I can't be certain, these doors may be Supa Doors. We manufacture the doors just north of San Antonio (about 45 min away from Terri) and distribute widely throughout Texas and the nation. The reason they stand out so much is that we use a 2-1/4" wide louver blade which gives it a much more upscale look than the traditional 1" louver blades found in commodity louver doors. 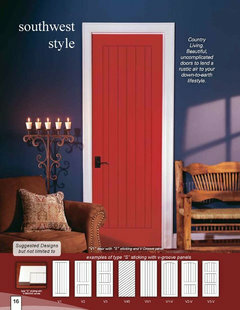 Since we build to order, many of the details of the door can be customized at our standard pricing. The other door looks mighty similar to our V1 door, but again can not be certain from the photos. 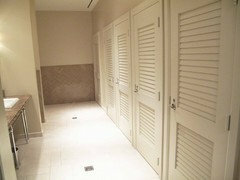 I've attached a couple similar photos used at a 4 star resort hotel and a painted red V1 Door. TERRI - BEAUTIFULLY DESIGNED HOME - KUDOS!! Wall, casing and base painting. - Would this application be suitable for a vaulted ceiling bedroom? Love the monochromatic with the wonderful up lighting. I won't have the up lighting and am concerned the warmth might be lost. Your guidance would be most appreciated. Thank you! Yes, I think it would be great for a bedroom. The warmth you want can be achieved through the use of fabrics on the window, bedding, upholstery, etc., as well as lighting from several sources. Thank you again. You are awesome to share and reply. What is the size of the individual louver? How much exposed? Difficult to find louver doors with increased louver size. Higher quality louver doors can be ordered through custom door fabricators. For a true custom door you can specify how the angle and size of the louvers. Very good question. There is a chance these are Supa Doors, which have as a standard beefy 2-1/4" louver blade. With the overlap, this leaves you with a nice solid looking 1-9/16" reveal. Regardless, if I were in your shoes, look for at least a 2" plus wide blades to get this look. Terri is spot on, we and probably other manufacturers can customize the size of the blade and the angle to some degree. Some manufacturers customize at no extra cost, so you can get the look you want at very affordable pricing. I'd verify warranty coverage, since many custom doors come without a warranty. Ideally the door will have a limited lifetime warranty. Best of luck. 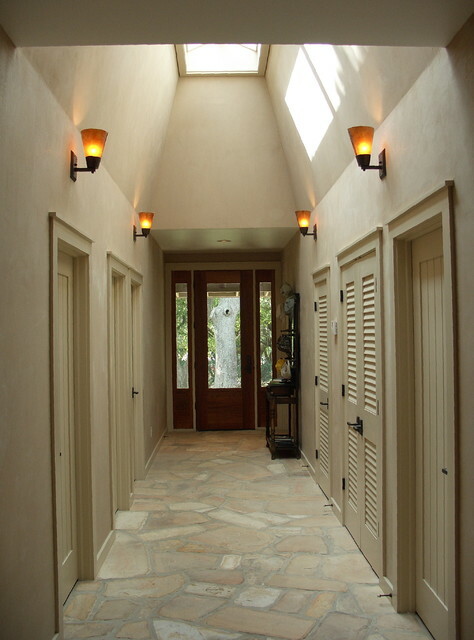 Could you please tell me the brand and color of the paint used in this hallway? Try Believable Buff 6120 by Sherwin-Williams. The walls are not painted. It is a plaster like material from "American Clay", which gives the subtle variations. Where did you purchase the doors? Also, what are the dimensions for the headers/trim on the doors? Where can I find the flooring? - Please advise where I can locate the flooring shown in the photo. You can find flagstone where decorative rock is sold such as stone yards and landscaping companies. There are a lot of variations and colors, depending on where it is quarried. You will also find variations in thicknesses and edges, so you want to have a very experienced stone layer to set the flooring. Which application/finish? - Which application/finish of American Clay is this? What's the brand of paint used on trim? Is it called American Clay? What advice do you have when mixing door styles? - We really appreciate the look you have created here. The horizontal and vertical lines work well. How did you decide on the balance? What color of American Clay was used? Thanks. What is the wall color and trim/door color? Looks great! Questioning my choice of trim and doors same color as adjacent wall - It has been suggested I do this and I can't find many photos that have this done. It this a trend right now or a personal preference? Ordered from a custom door fabricator, these louver closet doors are painted in a satin finish to match the American Clay application on the walls.